Leopards and Cheetahs and Porcupines, oh my! 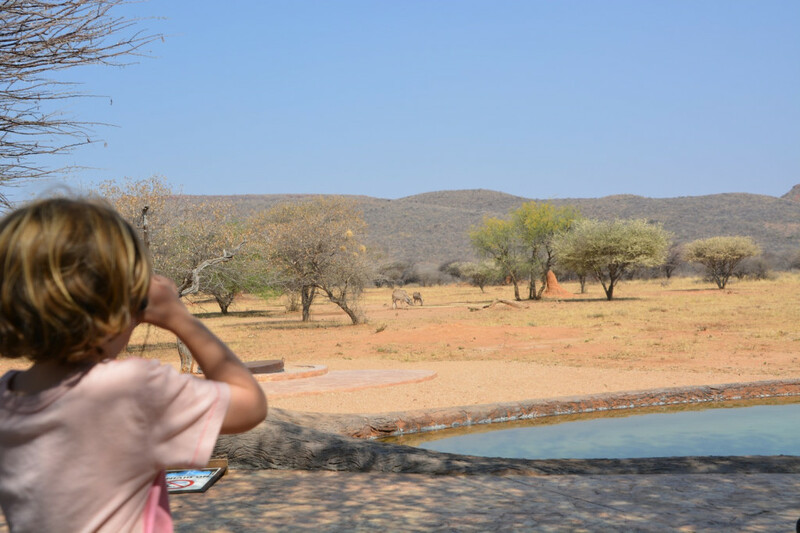 Our final resting spot in Africa was at the Okonjima Lodge , home of the AfriCat foundation private reserve. AfriCat is a family run, non-profit organization that works towards the long-term survival of Namibia’s carnivores, namely cheetahs, lions, and leopards. They have rehabilitation programs for orphaned or injured animals that they eventually release into the wild, as well as offer educational programs for locals and tourists alike. In addition, they work with farmers in the community to build and develop better methods to protect livestock (fewer cows eaten by cats = fewer cats shot or poisoned). 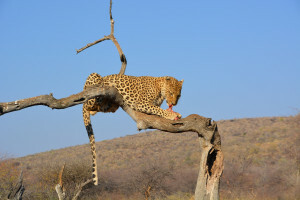 The foundation is 80% funded by the profits from the tourist business of the Okonjima lodge so one can feel reasonably good about the cash outlay. We stayed in a remote and beautiful bush suite, complete with its own swimming pool and flood lit water hole for game viewing in the evening. We had a private guide for the entire stay, a native Namibian from the Kalahari named Rohan. After learning a bit about the cats, we spent the first afternoon viewing the “captive” cats as they were fed dinner (captive in this case means being confined to a fairly large piece of land, such as hundreds of acres, not to a small cage). We learned that leopards are not endangered: they are far too reclusive and far too good at hiding to be threatened by humans. We also learned that cheetahs are pretty far down on the safari hierarchy (which goes something like: lion, leopard, hyena, warthog, porcupine, cheetah) and are not particularly interested in adult humans since we are a bit too large to be convenient prey. 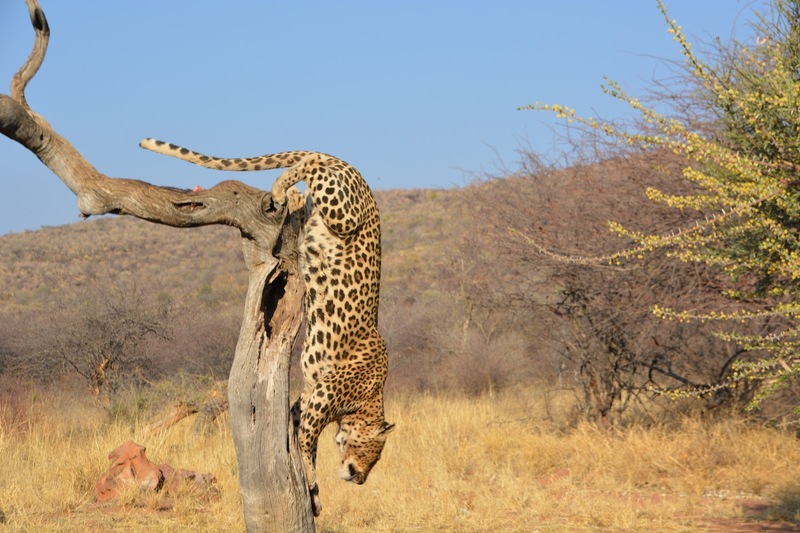 This is also why it is relatively safe to walk around among the wild cheetahs (with an armed guide, that is). Children, on the other hand, are of immense interest due to their bobbling heads, bodily proportions and frolicking nature. We were forewarned that kids’ high-pitch voices somehow trigger a dinner-is-about-to-be-served response in the cheetahs in particular. Indeed, it was genuinely disturbing and outright nerve-wracking to see how the cheetahs admired the kids through the fence. We tried to get Phineas and Eilir to keep their voices down, which as any parent knows can never be 100% successful. Sure enough, Eilir and Phineas spontaneously broke out into an off pitch and eerie version of Happy Birthday, which had a strong visceral effect on the cats. Immediately at the sound of their singing, the cats locked their gaze onto the kids and started sleekly pacing back and forth, hair raised along their backs, tails erect, not once letting their eyes break a line of sight from the kids. Even the guides were visibly nervous, standing at high attention next to the opening in the fence. Then, they were fed, and all tension dissipated. In the early hours of morning we arose to catch the sunrise and track the wild cheetahs in the open reserve. 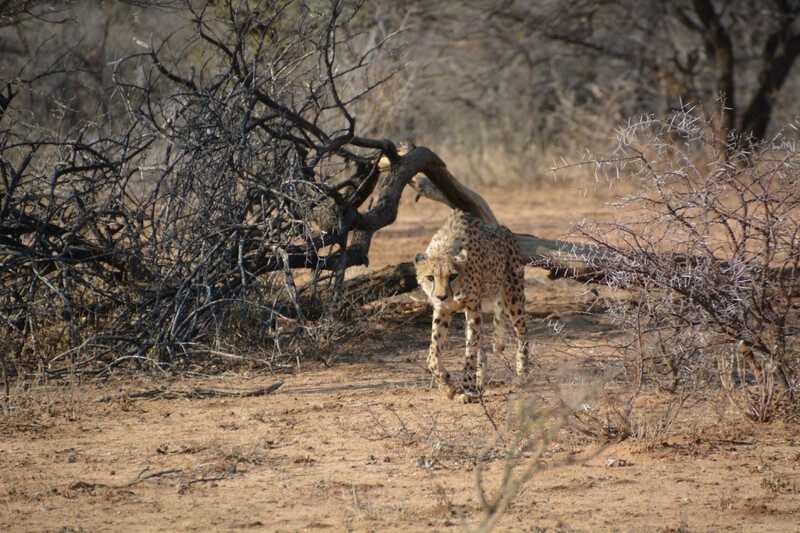 Rohan quickly found a group of three cheetahs who were sunning themselves by the road. He pulled the open-top jeep to a crawling pace, and ultimately stopped 30 meters from the cheetahs. Rohan suggested that we should get out of the vehicle to walk closer to the cats. Intuitively it felt like a really bad idea to step out of the jeep, but it was at once exciting at the same time. The cats barely looked at us as we walked among them: they turned their backs towards us to show us that they have seen humans before and they were not going to let us bother them. All the while as we were amidst the cats, Alexis was back in the jeep with Phineas and Eilir, struggling to keep them silent, terrified we might awaken their interest. Eilir was in near tears, proclaiming in painful whispers that she just couldn’t be silent any longer. Phineas was desperate to convince her to remain silent, since he didnt want any confrontation with the cheetahs. The morning progressed as we followed the cheetahs into a stalking hunt, their target: a baby giraffe resting in the nearby bush. In addition to us in the jeep, the cheetahs were being watched by the rather nervous mother giraffe whose bird’s eye view kept her one step ahead of the cheetahs. It was fascinating to watch the cheetahs’ silent communication and coordination as they pursued their prey. After a long while, the hunt was abandoned, presumably because the tension of the mother giraffe could be felt wide across the plains and was surely making other potential prey aware of their presence and imminent danger and thus threatening their chances of securing breakfast at all. Being in the wild and bearing witness to these primal acts of hunting, the graceful patience of the hunt, and the instinctual acts of protection by the mother giraffe were both awe inspiring and humbling. Soon enough we were back to civilization, bidding farewell to mother Africa, far the wiser and enamored with the continent as a whole. Having travelled to the Serengeti and across Northern Africa in the past, this trip to the South allowed us to glimpse the hope of these emerging economies and developing nations. We were welcomed at every turn with fairness, optimism and a genuine warmth. We are certain to return. Staffan with the cheetahs. I was pretty much freaking out keeping the kids quiet. Love reading everything you post.